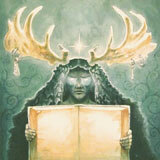 One of several metallic stalwart defenders of perfidious Albion currently plying their wares – Winterfylleth spring immediately to mind – proud Pagans The Albion Codex have been, unsurprisingly, snapped up by Sabbat/Skyclad mainman Martin Walkyier as the first band to release an album through his Horns Ablaze label. They may not have the burly, bruising thrash of Sabbat or the eclectic folk edge of Skyclad in common with Walkyier’s projects, but they do share ideologies and interests with the man – Paganism and this sceptered isle that they call Albion – and these shine through clearly in the music that they make. Purveyors of a highly individualistic melange of Heavy Metal and Progressive Rock with flourishes of Death, Doom and even Black Metal, The Albion Codex sit awkwardly next to fellow misfits and oddballs such as The Lord Weird Slough Feg, Hammers Of Misfortune and Manilla Road, which isn’t a bad place to be if you ask me. The sound of rain ushers in first number Witch In The Mist, followed by a subdued, clipped guitar line that quickly explodes into a divinely epic opening gambit of massive chords, colossal drums and snaking guitar lines that usher in the battle proper. A driving NWOBHM-style choppy guitar riff carried along on tumbling drums alternates with those brooding chords and snaking lines to create the most part of the song, atop which lead vocalist and guitarist Paul Wale spins his tale, dramatically backed at power-points by the deathlier tones of bassist Lee Whitaker to give extra weight when needed. Wale possesses as melodic, breathy, low-key voice that may not quite sound powerful enough with a more ‘traditional’ metal band, but fits nicely with the moody, progressive tendencies on display here. The band switch gears to a crystalline, quiet prog mode after a short while allowing Wale to stretch his quiet falsetto tones and for Whitaker and drummer Tom ‘Dexta’ Hey to push the beat around somewhat whilst lead guitarist Mick Jones adds subtle texture, before taking things back up again with a pulsing, scything throb of a riff that further ups the NWOBHM ante until finally taking us out with a sharp return to epic grandiosity. This balance between light and shade, the prog-inflected clean guitars rubbing up against the bruising ‘eavy metal axes is the common thread that runs through the whole album – along with the sterling performances from all involved, with Hey in particular impressing with his nimble, dextrous stick-slinging. Title track ‘Summon The Ancients’ itself appears out of an atmospheric synth intro, bass and drums giving way to driving heavy metal chugging and prog flourish with a cracking NWOBHM gallop to the chorus and some tasty intertwining riffplay. The band brings the doom and slows the action down halfway in, bulldozing guitars and drums emblazoned with twinkling and otherworldly accents and some deathly vocals from Whitaker, all giving way to that cleaner, more tranquil approach to take us to the end. ‘Man Or Antlered Man’ continues the clean/’eavy juxtaposition with aplomb, also having, to these ears at least, a very ‘Obssessed’ feel to some of the riffs and vocal lines – which is sure as heck no bad thing – and latterly an electric folk vibe to proceedings, with some Lizzy-esque high guitar harmonies. Very nice. The folk influence is very prevalent in ‘Swordwielder’ as twinkling acoustic guitar is the primary instrument on display behind Wale’s plaintive vocal and atop the subtly restless rhythm section, with Jones adding further icing on the very pretty cake. ‘Swear To The Gods’ brings things to a close with a slow-burning, quietly tense opening section that explodes into massive-sounding epic metal before bringing in the crawling doom once more, with Whitaker’s deathly bellow shadowing Wale’s strident wail and bursts of effected bass leaping out amidst the foreboding chords and ominous rhythms. A sudden flurry of black metal-style tremolo picking and blasting ushers in the concluding portion of the track, as it cycles through contemplative guitar, schizophrenic bass and drum breaks and relentlessly shifting rhythmic patterns that run beneath ominously crawling guitar riffs, eventually leaving us standing in a fading sampled rainstorm. Proudly rampant metal individualists, The Albion Codex have summoned forth a singular representation of their art and one hell of a powerful opening statement. Slight misgivings about the power of Wale’s vocals aside, Summon The Ancients is a sterling first release for Walkyier’s label and hopefully the first step on a long-running path for the band themselves.